building a brand that appeals to as many types of consumers as possible. But few brands succeed in truly reaching a universal market. It’s a time-honored tactic, in fact, to thrive by thinking smaller — focusing in on specific demographics, need states, or consumer identities to build loyalty. For a long time, this simply meant “college students” or “moms on the go,” but some brands have started to take things even deeper, selecting niche target audiences that live in their own communities or form their own online tribes. Brands big and small are now finding emerging subcultures to build their beds in. From startup recovery drinks crafting an identity around cult fitness brands to big soda companies focusing in on the emerging gaming community, we took a look in this two-part series at how companies large and small are searching for wide success with niche, but fast-growing communities. LIFEAID co-founders Aaron Hinde and Orion Melehan first met in a CrossFit gym in 2009, so it’s appropriate that their workout-based FitAid product would become the Official Recovery Drink of the 2017 CrossFit Games. FitAid, in fact, was carefully built and cultivated around this particular fitness subculture. Oft parodied for its customers’ cult-like devotion to their all-in style of workout, CrossFit has built a loyal consumer base, so a beverage brand built within the culture targeting not only their nutritional needs, but their whole identity, was in a good position to resonate. Its founders say FitAid, one of the multiple functional beverage sublines released under the LIFEAID master brand, is formulated with vitamins, electrolytes, and other ingredients to fit the needs of CrossFit athletes. The brand’s early business strategy involved getting the product in those gyms. In creating FitAid, Hinde and Melehan — like a large group of insurgent brands, from competing sports drink Kill Cliff, itself a former CrossFit Games sponsor, to a variety of energy bars and snacks — sought to find a way to access a large and still growing customer base made up of several key age groups. According to a report from Rally Fitness, CrossFit counts roughly 4 million members worldwide, with 42 percent ranging between 25 and 34 years old. 19 percent are between 35 and 44, while 18 percent are minors. The demographics skew evenly between men and women. The $4 billion company has experienced massive growth in the past decade, expanding from 13 locations in 2005 to more than 13,000 worldwide today. The company’s low-tech gym setup and franchise model has also given it the ability to rapidly scale and bring in new customers. Of the roughly 10,000 gyms LIFEAID products are currently available in nationwide, about 4,000 are CrossFit locations. As LIFEAID expands its distribution in traditional retail channels, its connection with its base gives it an extra edge in grocery and at retailers where CrossFitters shopped, such as Vitamin Shoppe. “That gym channel has been a great driver because it’s very consistent with that health-conscious consumer who we’re targeting,” Hinde said. “That consumer who happens to shop at Whole Foods, and at Kroger’s, and at Publix. We’re able to get turn from day one in a traditional retail environment, which is extremely crowded, because we already have that core community that we’re bringing to the table that we can mobilize. Having company leaders in Hinde and Melehan who live the lifestyle — and participate in the grueling events — gives LIFEAID another layer of authenticity. Knowing CrossFit’s unique vernacular and partnering with the culture’s celebrities for social media influence have both been vital to developing an authentic relationship with the consumer base, and not coming off as another invasive brand just looking to exploit a community. Working within CrossFit has also opened the door for Hinde and Melehan to move into similar fitness-based markets — a transition that reveals another set of growing fitness communities that are being targeted by entrepreneurial brands. 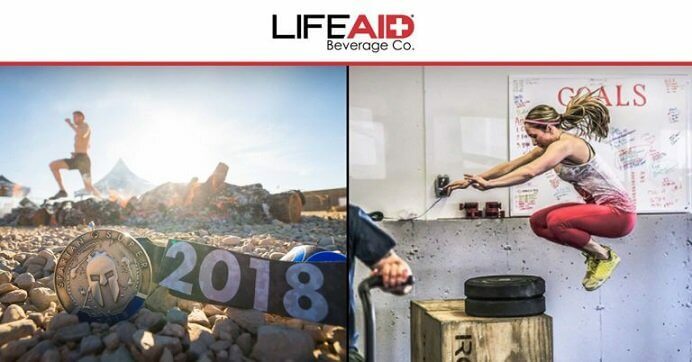 In 2016, Hinde and Melehan began running in the Spartan Race obstacle competition when LIFEAID (FitAid) was signed as the event’s official recovery drink. According to Hinde, Spartan Race and CrossFit had a significant overlap in their consumer base, giving the company “street cred” as it integrated and was introduced to new consumers. The company has innovated around the partnership, premiering CrossFit-exclusive FitAid RX and the protein-heavy FitAid Fuel snack packets in order to better fit the needs of that consumer. 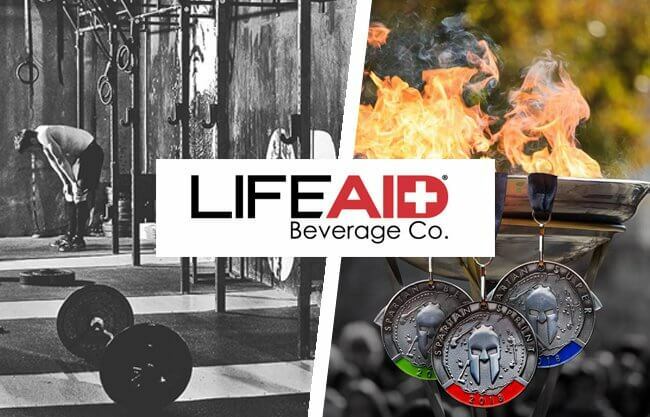 But beyond CrossFit and Spartan Race, much of LIFEAID’s portfolio is built around niche target audiences. Using a uniform can design, the company also markets products such as GolferAid, intended to help golfers improve their performance on the course, and TravelAid (now ImmunityAid), an immunity drink aimed at frequent travelers. The company’s FocusAid is recommended for students, gamers, and office workers and features Nootropics and other allegedly brain-boosting ingredients, while PartyAid focuses on providing clean energy. Similar to LIFEAID, in November, Kill Cliff—which has long fostered its own relationship with the sport and its athletes—partnered with another Spartan-like endurance event, Tough Mudder, to be the Official Sports Drink of its 2018-2019 season. The company also lends its name to the Kill Cliff Granite Games, furthering its presence in the competitive fitness world. Meanwhile, GT’s Living Foods is also running with the Spartans, bringing its kombucha products to races as an official partner. Dave said he and Spartan Race founder Joe De Sena have long been personal friends, but only last year did the two brands opt to capitalize on their synergy. GT’s Kombucha is being served at all U.S. Spartan Race events this year, and Dave said he sees big potential for the community’s “Spartans” to find value in kombucha as an alternative to sugar-heavy sports drinks like Gatorade. On Thursday, Spartan Race signed one of its biggest beverage partners yet, announcing BodyArmor as its Official Sports Drink through the 2019 season. The brand, one of the top selling sports drinks in the country seeing $130 million in sales in 2016, may lack the grassroots authenticity of a LIFEAID or the holistic health halo of a GT’s, but it can call on endorsements from some of the top athletes in pro sports. BodyArmor’s partnership with Spartan Race shows the niche market’s value to big brands. The clean hydration promoted by BodyArmor has potential to resonate deeper with Spartan’s base than an artificially flavored product would and, with the full endorsement of De Sena, it’s being welcomed in with open arms. Part II of this article will look at how brands are now targeting the emerging eSports tournament circuit as a way to bring in the millennial gamer demographic.